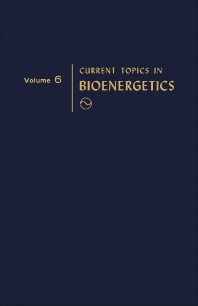 Current Topics in Bioenergetics, Volume 6 provides information pertinent to the phenomenon of energy transduction. This book covers a wide variety of topics, including photosynthesis, muscle contraction, transport across membranes, and oxidative phosphorylation. Organized into six chapters, this volume begins with an overview of the solute transport functions of membrane vesicles from kidney and intestine. This text then examines the specialized calcium transport system of mitochondria from both mechanistic and biological viewpoints. Other chapters consider the energy-transducing mechanisms in bacteria and chromoplast from the standpoint of mechanism. This book discusses as well ionophores and channel formers as powerful tools in the study of membrane function. The final chapter deals with the metabolic link between fundamental cell physiological events, such as hormonal perturbation of metabolism and cell development, on the one hand, and an altered ability of mitochondria to transport Ca2+, on the other. This book is a valuable resource for bioenergeticists, biochemists, biologists, and microbiologists.